We Care Partner Spine Hospital in India embraces the latest technologies and minimally invasive techniques for all types of spine procedures. Our goal is to enable patients to experience the least amount of pain and return to conducting their daily routines in an expeditious manner. 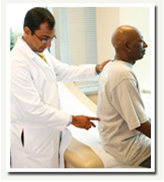 Patients of all ages come to us for comprehensive care for the full spectrum of neck and back disorders. These include: arthritis, pinched nerves, stingers, herniated discs, degenerative diseases, neurological injuries, whiplash, bone diseases (i.e. osteoporosis), spine fractures, and spine tumors. Patients seeking treatment typically experience pain, numbness, or weakness in the arms, legs, neck, or back, and the majority of them are able to benefit from non-invasive management of their specific conditions, but for others surgery may be the best solution. Our fellowship trained physicians spend a great deal of time with patients, discussing their condition and answering their questions, educating them about treatment options, and matching their expectations and goals with the best treatment plan. Our physicians work together with other spine specialists in a coordinated, multidisciplinary approach to achieve the optimal outcome for each individual. Other team members who contribute to patients' care include: surgeons, radiologists, pain management specialists, physical therapists, and physiatrists. Back pain affects 80% of Americans at some point over the course of their lives. Whether it comes in the form of lower back, neck, or sciatic pain, it is typically a symptom of an underlying condition such as osteoarthritis, muscle, disc, or nerve complications. At the Division of Spine Surgery, conservative, minimally invasive care is often the first approach to treating patients with neck and back pain. Due to our wide array of expertise, we often execute this with a combination of non-invasive treatment modalities such as physical therapy, back braces, rehabilitation and/or minimally invasive options such as injections. For many patients, back pain eases within as little as two weeks, regardless of the type of treatment. However, if conservative methods are not successful in alleviating pain, surgery may be the best alternative, depending on the circumstances and patient condition. Should a patient require surgery, he or she is a likely candidate for minimally invasive techniques that have greatly improved the recovery time from spine surgery. Traditional spine surgery once involved large incisions, causing patients to be immobile for many weeks, if not months. Thanks to new instrumentation and technologies, our surgeons are able to make smaller incisions, so patients are mobilized more quickly. These minimally invasive techniques can be applied to small and large herniated discs, spinal fusions, and laminectomies. The Division of Spine Surgery is dedicated to advancing new techniques and exploring new technologies through basic science and clinical studies. By generating new knowledge regarding the impact and prevalence of injuries and diseases of the neck and lower back, we assist with the cultivation of new devices and techniques to enhance the safety and effectiveness of treatment for patients.